There was a press release from the National Astronomy Meeting – which I go to every couple of years – suggesting that the Sun will return to Maunder Minimum-like conditions during the 2030s. This has been picked up by some as suggesting that we’re heading for a mini-ice-age. This kind of idea has been addressed before. The basic problem is illustrated in the figure to the right. If the Sun returns to Maunder minimum-like conditions, then that might imply a reduction in Total Solar Irradiance (TSI) of maybe as much as 3Wm-2. However, to determine the corresponding change in forcing requires considering the geometry of the Earth (approximately spherical) and the albedo (about 0.3). A reduction of TSI of 3Wm-2 would produce a change in solar forcing of about 0.5Wm-2. Anthropogenic forcings have, however, probably increased by more than 2Wm-2 since 1750, are currently rising at around 0.4Wm-2/decade, and will probably (unless we start reducing our emissions) continue to rise at at least this rate. A reduction in solar forcing of 0.5Wm-2 by the mid-2030s will therefore only offset about a decade’s worth of increasing anthropogenic forcings. Globally, therefore, the effect will likely be small, as illustrated by the second-to-last figure in this article. For a high-end decline in solar ultraviolet irradiance, the impact on winter northern European surface temperatures over the late twenty-first century could be a significant fraction of the difference in climate change between plausible AR5 scenarios of greenhouse gas concentrations. So, a return to Maunder minimum-like conditions could have quite large regional impacts, but globally is likely to have a relatively small effect, and would probably only delay global warming by about 10 years. Edit : As some have pointed out in the comments, the TSI reconstruction I’ve included here is a bit old and newer ones suggest a smaller change in TSI between the Maunder Minimum and now – maybe as small as 1Wm-2. If so, that would make the resulting change in forcing even smaller, maybe a bit less than 0.2Wm-2. Even so, it’s fairly clear that even a substantial reduction in solar activity would have a relatively small impact on global warming, compared to the likely anthropogenic influences. This entry was posted in Climate change, Global warming, Science and tagged Maunder Minimum, Mini ice age, Solar forcing, TSI. Bookmark the permalink. 101 Responses to Mini ice age? When you say, “delay global warming by about 10 years”, do you mean that after 10 years warming will carry on from where it was, or that warming will bounce back to where it would have been if it had continued unabated? I just meant what is illustrated in the second to last figure here. If we had some kind of grand solar minimum, it would take about 10 years longer to reach a particular globally averaged surface temperature, compared to a scenario where the Sun did not have a large reduction in irradiation. Thanks, I had thought of mentioning that likelihood in my response to John, but didn’t have a good reference. Their Figure 2 also shows that it recovers quite quickly (decade or so). Or am I being too harsh? Maybe it’s just my frustration knowing that I’m going to have to rebut yet another denial meme. I think that fig 2 in Meehl is what I was expecting. Surface temperatures (unlike the ocean) surely will react fairly quickly to changes in the sun’s output, but as soon as the sun returns to its former glory the temps will just bounce back to the level dictated by the greenhouse gas concentrations? Except, the press release is fine. Unless I’ve missed it, there is no mention of a mini ice age and it simply discusses the solar dynamo. It’s how it’s been interpreted in the media that’s the problem. Surely one would expect a better standard of journalism from the “Science writer and editor” of ‘Astronomy Now’? Yes, you would like to think so. That is certainly disappointing. ‘Tis but a small step to think that a re-occurrence of the conditions seen in the last mini ice age will produce another. If only they had added, “…but the current rise in temperatures as a result of human-caused global warming make another mini ice age impossible”. Yes, you’re right. I missed that. I agree that adding the latter would have been good. I suspect that they didn’t think anything of it. …and therein lies the problem. “The European impacts of a solar minimum could be larger than the global effect but it’s nowhere near enough to override the global warming trend due to man-made change”. You worry too much about the misuse of scientific results. I think that it’s equally (i.e. very little) justified to worry about the effect that putting that kind of additions to every possible place has on the public perception. Some skeptics may pick such points and refer to them in their texts, but that has zero effect on the balance on opinions. People on both sides keep to their views totally unaffected by such detail. I don’t believe that TSI reconstruction will stand the test of time. From what I understand the sunspot record has been substantially revised. Even if you’re right, that doesn’t mean that we should not aim to encourage press releases to be written in a way that minimises the chances of being misrepresented. I had heard something like that myself, but don’t really know the details. You’ve reminded me that I meant to add, in the post, that increased volcanic activity may also have contributed to the climate conditions during the Little Ice Age. So, it may not have been a low TSI alone that produced such conditions. Most ppl get their info on climate change via MS media (TV dominates, then newspapers if I remember correctly). It would be great if scientists would simply report their results in the driest of terms, those responsible for press releases would put it into laymen’s terms, and the media would report the implications accurately via scientifically literate journalists. But we have decades of experience to show this doesn’t happen… often. I think scientists have had enough time to realise that ppl will quote mine, lie, honestly misinterpret their results, etc. Therefore, I think anyone writing a paper should consider this, and try and make it as hard as possible to misinterpret. That won’t stop certain journalists/newspapers/networks from dishonest tactics, but it will make it easier for those that are interested in the truth to show that these sources are being dishonest. The misuse of scientific results are holding us back from dealing with reality and Johns worries are justified (imo). You’re right that people on both ‘sides’ will not change their opinion. However both ‘sides’ combined are vastly outnumbered by the great bulk of uninformed between the polarised extremes; the people whose views are formed by these erroneous newspaper articles. In democracies the opinions of the uninformed mass are what dictates political will. Large commercial operations wouldn’t spend so much to sow doubt amongst these uniformed if it didn’t delay action, to their short-term advantage. If we have concern about the impacts of climate change then it’s vital to educate the uninformed so they’ll in turn put pressure on their governments. Making it more difficult for research to be misrepresented is well worthwhile and will speed up the process of educating the public. ATTP: Was Phil Plait at the meeting? If so, did you speak with him? This study was about the sun, the statement that the solar activity will fall to the level last seen during the LIA is still a statement about the sun and within the specialty of the authors, statements about future climate are not. My preference is that scientists stick to their specialty and to issues directly related their research in the press releases. Giving that up may easily affect negatively trust in science. They could have left LIA out and mentioned only Maunder minimum and the years of that, but mentioning LIA is natural enough. I really don’t believe that any damage follows from that. On the other hand it’s perfectly right for the Met Office to comment on the climate implications. Corporate propaganda has become so potent that many Americans are addicted. We must leave our isolated rooms. We must shut out these images. We must connect with those around us. It is only the communal that will save us. It is only the communal that will allow us to build a movement to resist. And it is only the communal that will sustain us through mutual aid as climate change and economic collapse increasingly dominate our future. They could have left LIA out and mentioned only Maunder minimum and the years of that, but mentioning LIA is natural enough. Yes, but they should – ideally – be aware of the context. By mentioning the LIA without making it clear that you’re referring to the properties of the Sun during that period, not the properties of our climate, makes it easier for others to misrepresent what is being said. Was Phil Plait at the meeting? If so, did you speak with him? If you mean the National Astronomy Meeting, then I don’t know. I wasn’t at the meeting this year. Science press releases should convey two messages. The obvious one concerns the results of the study, the other should tell about science, and that message suffers when issues external to the study and outside the expertize of the authors get emphasis. If the science was astronomy or zoology I would agree with you; but as climate science is linked to an existential threat to society I must disagree. The difference of 3 W/m² you use in your calculation will then change to about 1 W/m². They all show a difference of the current TSI levels to the Maunder minimum of about 1 W/m² or even less. I wonder why Humlum presents a TSI reconstruction made in 2000 and not one the newer reconstructions? Thanks, very useful. I did wonder if there was anything more recent. However, it does seem as though the largest possible change would still only produce a change in forcing of a few tenths of a W/m^2, so small by comparison to the likely changes in anthropogenic forcings. …conditions on the sun, that is. Meanwhile back here on Earth we have this little carbon thing going.. Indeed, that’s the bit they should have added – IMO – to minimise the chance of this being mis-interpreted. Volcanism is the main driver of LIA cooling. Thanks, I had not realised the influence was potentially quite that significant. My view is that deviating from practices most suitable for presenting science is detrimental in the long run – and success in mitigating climate change is decided in the long run. Scientists are most useful as scientists, not as policy advocates. Stop it – I can feel the cosmic rays hitting me now. I disagree. If you know that you work in a policy relevant area, then aiming to make it hard to mis-interpret your press release is important. It’s also important even if you don’t work in a policy relevant area, but since it is less likely to actually happen, it’s less of a concern. Reblogged on http://garryrogers.com. Thank you. yes, Svalgaard.. Not sure where Leif is on final publication. Web H will be glad to know that the authors used Eurequa to derive the model. Clette et al. was published last year. Every scientist should certainly present her or his results making misunderstanding them as unlikely as possible, but that does not mean that they should go beyond their own science and discuss climate science when their own work is about sun. Sure, but then maybe they shouldn’t mention the “mini ice age” at all. As soon as you do something like that, you run the risk of it being mis-interpreted. In fairness, this press release isn’t all that bad. The media seem to have presented things that are not in the press release. However, anyone familiar with this topic could have predicted exactly this. a) CO2, as per Law Dome, CO2 stayed in ~280-285ppm range for 500 years, than dropped and stayed around 277 for 200+ years, until Industrial Revolution got going. From CDIAC, CO2 has generally ranged from ~180ppm (depth of ice age) to ~280ppm (top of interglacial). From NCDC, there’s ~8-10C difference from glacial bottom to interglacial top. b) CH4, from ~1400ppb to ~1200ppb as per Figure 1 in Mitchell, et al (2011) Multidecadal variability of atmospheric methane, 1000–1800 C.E..
From CDIAC, CH4 has generally ranged from ~390ppm (depth of ice age) to ~700ppm (top of interglacial). c) PAGES2K record shows lots of jiggles from volcanoes, but some of the drop into 1600AD (maybe 0.05C-0.1C) seems plausibly from CO2/CH4 drop, which again certainly preceded Maunder. Add in the sea-ice feedbacks, and finally snow-albedo effects, especially relevant to NW Europe, and you get ice-skating on Thames … but the Equator doesn’t notice all this so much, which is one reason why you have to read the fine print on temperature reconstructions. The most variable reconstructions are those that emphasize the Northern part of the NH, especially around the North Atlantic. As reconstructions cover more of the Earth, they tend to get less jiggly. I wrote that they could left LIA out, but on the other hand it’s a fairly well known concept linked to the subject of the study (was already before climate change became an issue). It would be natural to refer to it, if climate change were not an issue. Reacting so strongly to that is not surprising among people, who participate actively in the debate on various blogs on both sides of the opinion spectrum, but the apparent importance is highly exaggerated. In reality I don’t think it has any influence on opinions. It’s not necessary to dance on a tightrope. Insisting that scientists follow some guidelines to prevent misunderstandings in one direction gives actually credence to the claims of skeptics that scientists behave in a biased way. I’m talking about his ongoing work. I’ve never said or implied any such thing. Please don’t put words in my mouth. The magnitude of the long-term trend in solar irradiance remains uncertain. A reassessment of the stellar data (Hall and Lockwood, 2004) has been unable to confirm or refute the analysis by Baliunas and Jastrow (1990) that implied significant long-term solar irradiance changes, and also underpinned some of the earlier reconstructions (see Section 2.7). Several new studies (Lean et al., 2002; Foster, 2004; Foukal et al., 2004; Y.M. 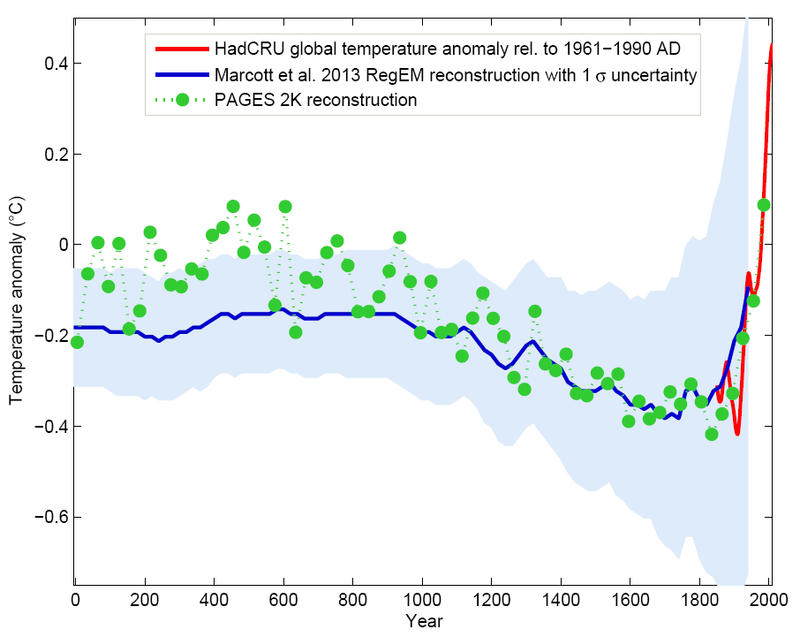 Wang et al., 2005) suggest that long-term irradiance changes were notably less than in earlier reconstructions (Hoyt and Schatten, 1993; Lean et al., 1995; Lockwood and Stamper, 1999; Bard et al., 2000; Fligge and Solanki, 2000; Lean, 2000) that were employed in a number of TAR climate change simulations and in many of the simulations shown in Figure 6.13d. In the previous reconstructions, the 17th-century ‘Maunder Minimum’ total irradiance was 0.15 to 0.65% (irradiance change about 2.0 to 8.7 W/m^2; radiative forcing about 0.36 to 1.55 W/m^2) below the present-day mean (Figure 6.13b). Most of the recent studies (with the exception of Solanki and Krivova, 2003) calculate a reduction of only around 0.1% (irradiance change of the order of –1 W/m^2, radiative forcing of –0.2 W/m^2; section 2.7). Following these results, the magnitude of the radiative forcing used in Chapter 9 for the Maunder Minimum period is relatively small (–0.2 W/m^2 relative to today). Kind of interesting to see how this story has exploded on internet over the last 24 hours. From what I understand from the discussion here, a new Maunder minimum event would decrease forcing equivalent to four, maybe ten, years of current emissions. I assume, based on the historical record, that such an event would last for a few decades. Recent research on carbon cycle feedbacks (nutrition restraints on terrestrial vegetation, tropical forest die-back and permafrost thaw) suggest that there could be, in this century, ~400GtC (my calculation) of net emissions above the CMIP5 model predictions, at least in the RCP8.5 scenario. That emission level is equivalent to about 40 years of human emissions at current rates. The forcing some from those emissions will be with us for centuries or longer. I find it odd that there is so much public attention paid to predicted solar variations (welcome though a new Maunder would be) when effects here on Earth—that we still have the ability to influence—could have ten times the effect and last ten times or more as long, and with an opposite sign. Preben: there is a regular machine for disseminating such things, as seen recently with Ivar Giaever again. Desirable-to-some nonsense propagates quickly. BBD no problem… Its a great page and I usually check it more often. I wish more guys would do what he does. With a tip of the hat to Eli, here’s a short radio interview with Zharkova that reveals that she alone is the source of the Little Ice Age hype. It’s not the fault of the media for once. Another factor is the pressure to talk up the significance of one’s results. One’s institution is usually publicity-hungry, and media offices like to link (no matter how tenuously) your research to matters likely to catch the attention of news journalists and the public. And of course, as long as it doesn’t backfire, such publicity will enhance your next funding application. He challenges ATTP to “demonstrate that you even comprehend what I mean by changes in spectral emission” which is rich, although consistent for him. I’m banned over there but maybe others want to comment. Euan Mearns doesn’t seem to have a clue about the accuracy of “spectral measurements”, which until 4-5 years ago were basically an afterthought. Oh wow, that’s a bit rich coming from Euan, especially given that I pointed out at the end of my post that such changes could have large regional impacts, mostly related to changes in the UV flux influencing heating in the stratosphere. I’ve only commented there once, and that was pretty much enough for me. Have no great interest in dealing with people whose arrogance and level of hubris is as high as Euan’s is. Those who believe that The Sun rules earth’s climate have always lacked a convincing and proven mechanism. So maybe this could be it. All that the Zharakova paper is discussing is the possibility that the Sun will return to Maunder minimum-like conditions by the 2030s – i.e., it’s discussing solar variability, not the influence of the Sun on our climate. It does not present a mechanism for illustrating that the Sun rules Earth’s climate. Of course the Sun is the dominant energy source for our climate, but it is not the dominant driver of 20th century warming and the NAM press release makes no suggestion that this might be the case. If he can’t get this basic point, he really shouldn’t be making pronouncements about others’ understanding of changes in spectral emission. Any reduction in global mean near-surface temperature due to a future decline in solar activity is likely to be a small fraction of projected anthropogenic warming. So, as I was pointing out in the post, the global impact will probably be small, even if there could be quite large regional impacts. Given that the Earth spins while rotating around the Sun the Earth as a whole will cool with less heat. You may need to explain what you mean. The relevance of the spin, together with atmospheric circulation, is that we have smaller longitudonal temperature gradients than we would have were we not spinning. The amount of energy we receive per unit time is, however, unchanged. If you define an average temperature in terms of energy balance (and ignore the greenhouse effect) then it is unaffected by the spin. On the other hand, if you define an average temperature as the average of the temperature, then you do get an answer that depends on spin and atmospheric circulation. See, for example, the Moon and this comment. I think the contribution of volcanic cooling to the little ice age was far greater then the solar contribution. Dallas might be referring to the factor of 8 reduction of the solar insolation at the top of the atmosphere as compared to the TSI which is the solar energy projected onto a plane at the Earth. 2 comes from the rotation, 4 from the projection of a plane onto the spherical surface. Also, Oceanic Acidification isn’t reduced by this method, so we still need to greatly reduce CO2 emissions. Maybe I’m being stupid, by why 8? than they are to the global average. are more related to the peak than to the average. ever since the slowdown became apparent. The point is that 3 W/m^2 is 0,22% of 1360 W/m^2. That should be compared with 0.22% changes in other variables, not to 0.88% changes. It’s true that different forcings lead to somewhat different effects, but not to dramatically different changes. It’s not the sun. Nor is modest solar variability going to make any significant or lasting impact on the rising anthropogenic forcing from CO2. And that’s it as far as rational discussion goes. Say the physics is right in the original paper (and I’ve not yet seen it confirmed, and I’m skeptical of it), then solar forcing would be reduced a small amount. So, in sum, the +/- effects of solar forcing is probably very minor, even if this paper is an understatement, compared to other effects. It is highly unlikely that any slowdown because of this change would even be noticed. Yes, I agree that the global effect will likely be small. News business is interesting business. Headline is bad but content about okay..
What you probably won’t hear from “skeptics” is that scientists are trying to scare us all over again (like the 70’s) with talk of another ice age. This time I think they will either ignore it or go full bore with the idea of the coming mini ice age. Yes, that irony is not lost on me. Being consistent is not, however, a requirement for “skeptics”. No, they certainly won’t ignore it. They are playing it as “scientists predict warming, scientists predict mini-ice age, so scientists don’t really know anything. The counter of course is that Zharkova is one of the 3%, not the 97% and is well outside the mainstream, in addition to being a solar, not a climate scientist. That I had failed to remember in this context. That was key indicator for start of athropocene recently I believe.. But not yet integrated to models? Or has it? “LIA was caused by CO2 drawdown in Americas”. is a bit too strong. I do think it’s a clear marker of anthropogenic influence, and I’ve often reminded people of it, especially as it clearly preceded Maunder and Dalton. hence ice-skating on Thames … but less effects in most parts of world. This is why extra-tropic NH temperature reconstructions tended to jiggle around more than full NH (like MBH99) or others. The jiggles in those 2000-era reconstructions got a lot of people excited because they either didn’t read the fine print or didn’t want to. The effects are clearly visible in the massive PAGES2Kwork, which shows continents. See volcanic activities, including around 1600, 1700 and 1800, Those clearly had effects, although the sharp CO2 drawdon into 1600AD is unique in the last 2 millennia. Around 1600CE, the only drak blue (sharpest cooling) is Europe. See also Stefan Rahmstorf @ RealClimate, specifically Marcott compared to PAGES, i.e., global, but oceans vs continental. Oceans don’t jiggle as much. Anyway, the evidence is quite strong that it was cooler during the LIA period, but it was part of a slow descent whose effects were strongest in Europe. Anyway, all this makes nonsense of the constant refrain “It’s the Sun.” or the continual abuse of Lamb(1965), as per MedievalDeception. It’s interesting that they assume we are headed for a mini ice age (or global warming is over) based on no scientific evidence while at the same time virtually all of the available evidence says we aren’t and that the effects on a new minimum would be very small. We are already in an ice age. We are overdue for the next glacial period. This is not a hoax. This is real science. We have been in an ice age for 2,000,000 years with regular glacial and interglacial periods, the latter of which we are in right now. MediaMatters for America has weighed in on the CNN article cited in a earlier comment. BTW, ATTP’s OP is cited in the article. Thanks. It’s a good article. In another case of serendipity, Phil Plait has posted an article on this matter as well. ATTP: Glad to be of service. It will be interesting when the science realizes that TSI influences ENSO variations. Changes in the density of water above and below the thermocline are sensitive to TSI variations. And this density diff impacts the sloshing dynamics. Changes in the density of water above and below the thermocline are sensitive to TSI variations. I don’t have a prediction for what will happen over the next twenty years. However, I am curious and evidently, there’s more confidence in the reliability of forecasts of solar dynamics than there is for earth climate. If the solar forecasts are correct, the next solar cycle or two will provide and interesting experiment for earth climate and it is probably wise not to draw conclusions before the observations have occurred. evidently, there’s more confidence in the reliability of forecasts of solar dynamics than there is for earth climate. Their prediction for cycle 24 has proved badly wrong, over-predicting maximum sunspot number by 50-100%, and missing timing of maximum by a couple of years. Paul S, fair enough – solar models are for many things which can’t be directly observed. But as far as this predicted solar event, even more reason that predictions of resultant climate effects are premature. Let’s see what actually happens. Think about this. This predicted solar event refers only to what will happen on the Sun. That it has turned into a discussion about climate is essentially because the press release made a mention of the mini-ice-age and the lead author did little to discourage such comparisons. The work in question has no direction relation to climate change.